The Saxton McKinley House in Canton celebrated its national debut as the home of the National First Ladies’ Library with a dedication ceremony and Victorian Gala in June, l998 with Former First Lady Rosalynn Carter. Known as the Grand Lady of Market Avenue, the Saxton McKinley House breathes new life as the first ever facility dedicated to documenting the lives and accomplishments of America’s 41 first ladies and other important American women in history. 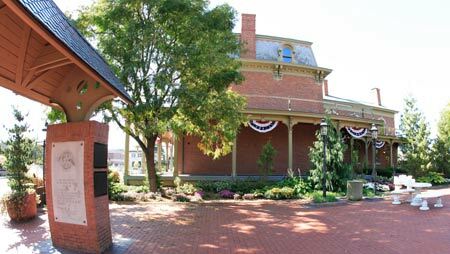 Located at 33l Market Avenue South, Canton, Ohio, the library is as unique as the women it serves. The Saxton House was built by George Dewalt around 1840 with a substantial section added in 1870 by his son-inlawn, James Saxton, father of Ida Saxton, wife of William McKinley. This was the home of Ida, prior to her marriage to William McKinley and during the time William served in the U.S. Congress from 177 to 1890, and as Governor of Ohio from 1891 - 1895 before being elected as the 25th President of the United States in 1897. The structure was placed on the National Register of Historic Places in 1979. In 2000 it was established at the First Ladies National Historic site. Ida was born in Canton, Ohio, in 1847, elder daughter of a socially prominent and well-to-do family. James A. Saxton, a banker, was indulgent to his two daughters. He educated them well in local schools and a finishing school, and then sent them to Europe on the grand tour.